The NVIDIA GeForce GT 520MX is an entry level dedicated laptop graphics card presented in 2011. It is based on the GF119 like the GT 520M, but features a higher core and shader clock rate. Using DDR3, the 64 Bit memory bus may become a bottleneck of the graphics card. As an entry level card, the GT 520MX has to compete against the Intel HD Graphics 3000 in the current Sandy Bridge processors. Due to the higher clock speeds, the MX should be faster than the GT 520M which was only slightly faster than the HD 3000 but clearly still beyond the faster GT 525M. Therefore demanding games like Crysis 2 or Mafia 2 run only in lowest detail and resolutions fluently. Less demanding games lik Fifa 11 or Sims 3 should be playable even in high detail settings. As the other 500M series chips, the 520MX supports Bitstream HD Audio (Blu-Ray) output via HDMI. That means the card is able to transfer Dolby True HD and DTS-HD bitstream-wise without quality loss to a HiFi receiver. The GT520MX offers the PureVideo HD technology for video decoding. The included Video Processor 5 (VP5) supports feature set D and therefore the GPU is able to fully decode MPEG-1, MPEG-2, MPEG-4 Part 2 (MPEG-4 ASP - e.g., DivX or Xvid), VC-1/WMV9, and H.264 (VLD, IDCT, Motion Compensation, and Deblocking). Compared to the older VP4, the VP5 offers faster decodes at lower power, HD-to-SD transcodes and 4K x 4K resolution H.264 decode support. 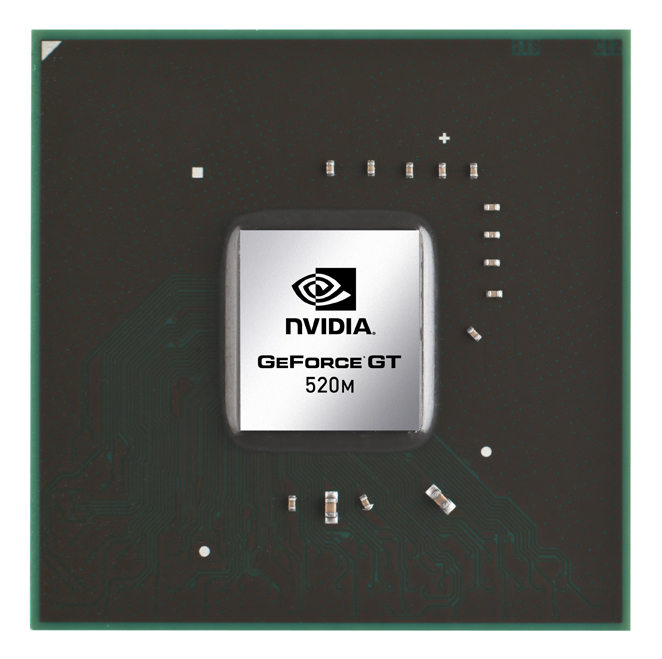 Through CUDA, OpenCL, and DirectCompute 2.1 support, the GeForce GT 520MX can be of help in general calculations. For example, the stream processor can considerably faster encode videos than a fast CPU can. Furthermore, physics calculations can be theoretically done by the GPU using PhysX (e.g. supported by Mafia 2 or Metro 2033) but the performance wont be sufficient for this.